Noel Almeida, CPCU; Shawn Almeida, Marine Manager; Tracy Sullivan, Customer Service Representative. Almeida & Carlson has a 30 year tradition of being a leader in providing Marine Insurance for Private and Commecial Boat Owners, Marinas and Boat Yards. They represent many financially sound Marine Insurance Companies and their Marine Department staff has many years of practical boating experience. Member MA & CC Marine Trade Associations. Offices in Sandwich, Falmouth & Plymouth. 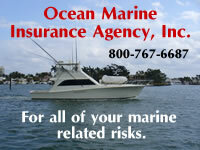 Ocean Marine Insurance Agency, Inc. Ocean Marine Insurance Agency, Inc. has been servicing your insurance needs along the East Coast for over 25 years. As an independent agent, we work with select insurance companies that have proven their performance over the years. Our goal is to assist you in all your maritime insurance needs. The Insurance Agency of Cape Cod Inc.
Full lines insurance agency able to provide quality products for the right premium for all your insurance needs. Benson, Young & Downs Insurance Agency, Inc.
C.L. Hollis Insurance Agency provides you with the underwriting and claims expertise you need in today's marine industry. We can customize coverage and manage unusual issues. We can coordinate loss condition surveys and provide direct consultations quickly and efficiently.